When we take the name health; varieties of definitions and synonyms comes to our mind. In the present world, different kinds of treatment processes have been developed. Many require modern technologies, nature, fermentation process and many more. Each of them possesses their own methods. Our concerned site is “Theayurveda.org”. What do you get when you listen/read this word? so here is a short introduction to Ayurveda. It means its a section where all kinds of Ayurveda, Naturopathy, Yoga, Herbal medicines and spiritual healing methods are present. It is like a book; where we will be introducing you to all the aspects and the secrets of longevity. As a book starts with the introduction page. Similarly, our site will get inaugurated with the ‘Introduction to Ayurveda’. First thing comes to our mind is, what is Ayurveda? The simple meaning of Ayurveda is “Science of life”. It was discovered approximately 5000 years ago. It is a natural, holistic treatment accompanied with herbal tactics which provide you longevity and an eased life. Ayurveda is the origination of India itself and is considered as the ancient form of treatment. In fact, Atreya Punarvasu was the advisor and acharya Agnivesha was the main author of Charaka Samhita, whereas Acharya Charaka was the actual redactor and acharya dridhabala was the completer of this Samhita. Precisely, Charak and Sushrut are two reorganizers of Ayurveda whose works are still extant. And then Ashtanga Hriyadayam is a concise version of the works of Charak and Sushrut. Consequently, Ayurveda is the only complete ancient medical system still in existence. 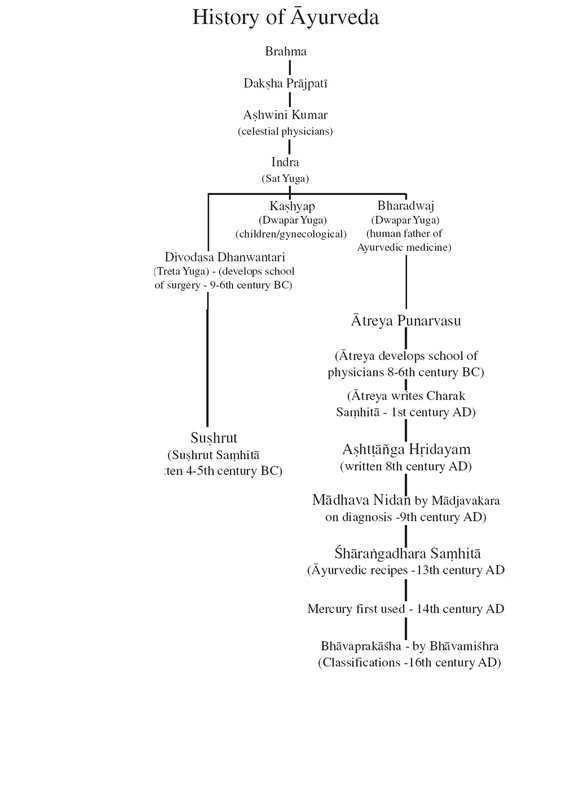 Agnivesa, under the guidance of the ancient physician Atreya, had written an encyclopedic treatise on the 8th century B.C. However, it was only when Charaka revised this treatise that it gained popularity and came to be known as Charaka Samhita. For two millennia it remained a standard work on the subject and was translated into many foreign languages, including Arabic and Latin. There were 8 main chapters in this book. There had been 120 subchapters of which they all in total had 12,000 shlokas and description of 2,000 medicines. There were cures for diseases related to almost everybody part of human body and all medicines had natural elements without ant chemicals to cure the diseases. Here is the Image of how Ayurveda was passed from God to Angels and then to the human. India is the holy land of saints! Earlier, a couple of decades back; this land was surrounded by spiritual chants and divine knowledge of Vedas. The first college of Ayurvedic knowledge was “Nalanda university” in India. It consists of thousands of books which were believed to be1,200 years old refreshed with complete Ayurvedic knowledge. Unfortunately, the books and scriptures were burnt during British reign and all the universities related to Ayurveda were closed. This was like the decline of Ayurveda; in India itself. What can be merciless than this? As the time passed, steadily Ayurveda practice was again started and as the result, many new colleges and universities flourished all across India. The oldest medicine Ayurveda; is now the last to be rediscovered. In the present world, foreign countries have adapted themselves to get cured and prevented through Ayurveda. The miraculous effects marked a great impact on life. In Ayurveda treatment, many types of therapies and treating methods are accompanied like Colour therapy, Herbology, Pancha Karma, Meditation, Aura therapy, Yoga practices, nutrition and many more. The description and effects of Ayurveda have also been listed in the holy books of “Shrimad Bhagwadgeeta”. Ayurvedic treatment is free from surgical processes also called Shalya Tantra. Earlier, it was practiced using dead bodies for the experimentations and teachings. There are many more sections in Ayurveda depicting each of them with their own specific field. In Ayurveda, spirituality is also present; it simply connects your soul to the almighty spirit. Still, the modern technologies and scientists are aware of the fact; how spiritual healing occurs! Well, it is all about the faith and hope. Nowadays, MRI scans, CT scan, X-rays etc are present to detect the ailment or injury. Earlier, these were not present and the physicians were able to detect the diseases normally which was relatively same as the today’s reading. Ayurveda is the treatment process which is easily accessible and affordable by everyone. It is a fact that those Ayurveda doctors practicing for the sake of fame and fortune then they can never be a good doctor. Ayurveda is all about to uproot your ailment with an eased way. Ayurveda was originated in India itself; still very less practiced in its native country only. Guys lets shake hand and pledge to raise the flag of India much higher though opting for Indian treatment. So, go natural life well! You can Ask your Query related to Introduction to Ayurveda, exercise, and Ayurveda in Our Ayurveda Forum. Why obesity is spreading worldwide? All the best to the author and the site. Long way to go and we should promote our Indian tradition always. Ayurveda is very famous and practised in abroad but in India still it is getting neglected. Thanks to Ramdev baba and Narendra Modi for taking stand and promoting our ancient assets like #Yoga, #Ayurveda, Shrimad Bhagawat Geeta.